Dniester River is one of the major trans-boundary rivers in Eastern Europe. Its length reaches 1352 km and its catchment area covers 72, 100 sq. km. Originally Dniester flows only through the territory of Ukraine, but then her fountain falls within Romania and Moldova. Dniester River rises on the slopes of mount Rozluch in the middle part of the Carpathian Mountains, near the village Vovche at an altitude of about 900 m. The spring of the Dniester is near Drohobych, near the border with Poland. It flows into the Black Sea through the estuary, which has formed the Dniester peen Firth. Dniester peen Firth was formerly known as Ovidievo lake. Firth of the Dniester are vdava in land in the direction from southeast to northwest. Its length reaches 41 km and its width is from 4 to 12 km at an average depth of 2, 6 meters. Lagoon Bugaz is the bay separating the sea by a narrow sandy strip, whose southern portion is the water connection. There is a narrow strip of land crossing a railway line connecting Odessa to medieval Belgrade and throughout the region Budjak which constitutes the southernmost part of the Odessa area. To the railway station of the village Karolina-Bugaz is a Black Sea resort Zatoka. Usually in winter Dniester freezes. Here are the ports of Belgorod and Dnestrovski, Ovidiopol and Karagyolsk Bay. Before reaching the Black Sea a small part of the flow of the Dniester outlines the border between Ukraine and Moldova (225 km), then for over 400 km it flows through Moldova, releasing most of the territory of Transnistria. Subsequently Dniester again serves as a border between Moldova and Ukraine, and then heads to the Black Sea. Dniester River runs at the end of the Eurasian steppe. Its most important tributaries are Răut River, Bîc River and Botna River, which flow into the Dniester in the east. West, tributaries of the river are even more. The lower half of the western coast is characterized by high altitude and hilly terrain, and east is lower and even. One of the largest cities located on the Dniester are located in Southeast Tigina, Moldova, also known as Bender, and Tiraspol. Before World War II Dniester was part of the border between Romania and the Soviet Union. In those years the river had been the reason of discord between the two countries - many battles were fought on its left bank, in which German and Romanian troops have faced against the Soviet Army. 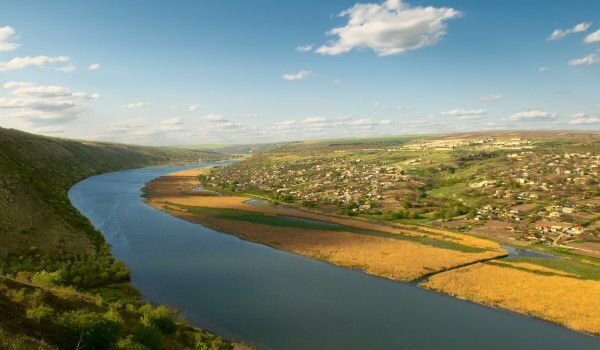 Currently the total population of the river Dniester in Moldova and Ukraine is about 8 million people, 5 million in Ukraine and 2.7 million in Moldova. Dniester is currently facing environmental problems due to pollution. One of the interesting sights of Dniester is the Khotyn Fortress, which is located on the right bank of the river, 69 km northeast of Chernivtsi, in the northern part of the historic district of Bessarabia.